A heartwarming story from Portsmouth, Virginia is crossing the wires: A dog found near death by animal control and sent to the Portsmouth Humane Society has been adopted and is doing well in the care of her new owner, a veterinary technician. The dog — named “Hope” by Portsmouth Humane staff — was lucky to survive, as news reports indicated that she was so emaciated and swarmed by flies that animal control officers thought she was dead when they found her. The dog was lucky for another reason, too. Portsmouth sits across the Elizabeth River from Norfolk, home of People for the Ethical Treatment of Animals’ shelter of horrors, where last year the group killed nearly 90 percent of the pets in the group’s care. If circumstances were different, Hope might have needed to abandon all hope. We run a shelter but in the most merciful way. We help–because no one else will–the animals who are society’s rejects in the area near our Virginia headquarters. These animals are aggressive, feral, on death’s door (often with large tumors hanging from their bodies), or otherwise unadoptable. While there is plenty of evidence that disputes the “death’s door” claim by Newkirk, it stands to reason that Hope, having been found so emaciated that trained dog wardens thought her dead, would not have any hope in PETA’s shelter. Perhaps they should call the recovering dog “Lucky,” since she not only survived a delinquent former owner but avoided being the recently killed subject of a PETA self-defending “but we only kill desperate animals” blog post. As for “aggressive” dogs, what about the animals seized as part of the Michael Vick dogfighting case in Surry — again, not far from PETA’s HQ? Many of the animals were rehabilitated through hard work and have new homes. 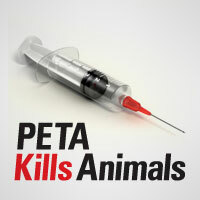 They may well have been put down if they had been given to PETA. So, donors have a choice: Rehabilitate sick dogs by donating to their local shelters, or help a multimillion dollar national group buy drones, while it kills pets in the name of mercy. Sounds like an easy choice to us.